This is a popular e-commerce platform, but does it really deliver? A powerful e-commerce pick for experienced WordPress users. WooCommerce is an open source WordPress-based e-commerce platform which powers more than 30% of all online stores. Browse down the feature list and it's easy to understand WooCommerce's success. There are no arbitrary limits on products, variations, orders, or anything else. You're able to sell anything from physical products and digital downloads to services, tickets, memberships, even other vendors' products, without WooCommerce taking a transaction fee. And because the system is based on WordPress, you automatically get access to countless themes and site-extending plugins. Order processing is just as comprehensive. WooCommerce offers multiple shipping options and rates, all highly customizable (you can offer pickup or local delivery based on location, for instance). Taxes can be automatically calculated based on your base address, your customer's shipping or billing addresses. Payment isn't just restricted to cards and PayPal: WooCommerce can handle multiple payment gateways, bank transfers, checks and cash on delivery, too. Professional features include the ability for customers to create accounts, with a guest checkout option for those who aren't interested. Inventory and order tools allow tracking of stock levels and management of the fulfillment process, and you can even have the system send email notifications to customers at key points (after they've made a purchase, or when their order is complete). As WooCommerce is free in its base form, you can get started by signing up with just about any web host. WooCommerce recommends SiteGround, where the baseline StartUp plan gets you 10GB of web space, unlimited email accounts and databases, a free Let's Encrypt SSL certificate and data centers on three continents. It's priced at £2.75 ($3.85) a month for the first term, £6.95 ($9.73) on renewal. If the core WooCommerce service isn't quite enough, you can customize it with almost 300 extensions. These include support for multiple product add-ons (gift wrapping, custom messages), integration with popular shipping providers, invoice and packing list generators, gift certificate and coupon systems, a complete calendar-based booking service, and more. 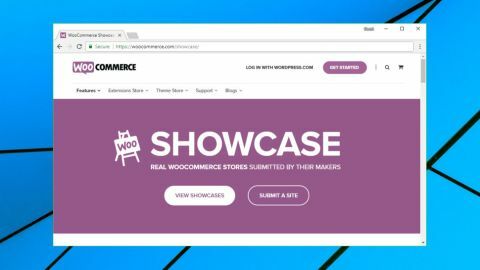 Prices range from free up to $299 (£215), and you can find out more on the official WooCommerce extensions page. The main WooCommerce setup process starts by creating a free WordPress account. This only takes a moment, or you can log into an existing account if you have one already. Formalities out of the way, WooCommerce asks you various questions about your requirements: the industry you're in, the type of products you'll sell (any combination of physical, digital, services, tickets, memberships, other vendors' products), payment options (on purchase, pre-order, subscription, in person, payment plan, offline) and the installation type (bundled with a SiteGround or WordPress hosting plan, automatically installed on an existing site, or manually via a plugin). Another option could be to sign up for a hosted WooCommerce account, as you'll get web hosting with WooCommerce pre-installed. For the purposes of this review we signed up via SiteGround's WooCommerce plan, although you can probably achieve much the same results with any hosting account that supports easy installation of WordPress. (Bear in mind you'll want a plan with an SSL certificate to reassure customers that it's safe to hand over their details). Whatever you're doing, life will be much easier if you set up the service using a real domain rather than a temporary hosting URL you'll change later. You'll need to register that domain and set up its DNS records before you can start playing with WooCommerce. WooCommerce is based on WordPress, and so your initial login will probably take you to a demo WordPress blog post in a plain blog theme which doesn't look anything like the kind of web store that you need. Fortunately, this is easily fixed. Heading off to the WordPress dashboard reveals a WooCommerce menu, and choosing that allows access to the Setup wizard which provides a speedy way to define and configure your site. The wizard covers all the admin basics. You're prompted for your store address, home currency and whether you're selling physical and digital products, or both. WooCommerce can set up PayPal and Stripe accounts for payments (other gateways can be configured later). It also defines some very basic shipping rules (one zone for your home country, one for the rest of the world), plus there's optional installation of a couple of WooCommerce plugins (automatic tax calculation and collection, and MailChimp for marketing) – then you're done. This is all very easy to use, and worthwhile just for the ability to set your shipping basics, but it can't do everything. You can choose to install the MailChimp plugin, for instance, but it won't create an account for you or set it up fully. You'll need to figure that out for yourself. The WooCommerce design customizer gives some basic control over the look and feel of your store. You can change the theme, at least in theory (there's only one installed by default), add a logo, configure headers and footers, play around with colors and add custom CSS if you need it. An Import tool supports importing your product catalog from another platform. The system can handle source CSV files up to a chunky 128MB, and the import routine is way more intelligent than most. It doesn't demand that file is in a fixed format, for instance, instead reading in the column headers, trying to match fields in the source file with its own, and then giving you the chance to remap any or all of the others. If anything can import your catalog, WooCommerce should be able to do it. The tools for manually adding and editing your product details are another highlight, because of course they're based around the WordPress editor. This automatically ensures they're easy to use, can be extended in many ways, and will be familiar to many users. Media support is excellent with the ability to add single images, galleries, audio and video playlists. These can in theory be hosted on your own site, too (a video could be stored in your web space rather than linked from YouTube or elsewhere), assuming your web hosting plan allows that (budget plans might forbid streaming). WooCommerce doesn't offer you as many product options and settings as the likes of BigCommerce, but there's more than enough to cover the basics. A small tabbed area under the main editor gives you everything you need to set up your product type (physical, virtual, downloadable), pricing, inventory rules, shipping details and more. Setting up shipping is probably going to require more work, and the addition of a shipping plugin for the best results. WooCommerce Shipping comes free and gets you live rates for USPS and Canada Store, while multiple plugins are available for most of the other big shipping services and names - ShipStation, FedEx, UPS, Royal Mail - which are typically priced at $79 (£56). Overall, WooCommerce's WordPress-based approach might confuse total beginners, but WordPress fans or experienced e-commerce users will quickly find their way around and should be able to get a capable site up and running at speed. Once your store is online, WooCommerce provides all the core essentials you need to manage the business. Capable stock handling tools allow you to track stock levels automatically or edit them yourself. Notifications for low and out-of-stock items keep you up-to-speed with your inventory, and the store can adapt to out-of-stock situations by hiding the sold-out items. This isn't quite as versatile as BigCommerce, which can hide them from navigation but keep the product page (useful if someone has followed a direct link), but it's enough to get by. If others are helping you with the store, WooCommerce allows you to give them access via their own accounts. Trusted users can have full administrator rights to make whatever changes to the system that might be needed, but you can also set up more basic accounts which only allow users to perform simple tasks, perhaps processing orders and viewing reports. Blogging isn't an issue, of course. With WordPress to hand, you have all the power you could ever need to help you develop a compelling store blog. If you require more functionality, WooCommerce has a library of extensions to explore. This can't match the sheer quantity of add-ons that you'll get with competitors such as BigCommerce and Shopify, but there's still plenty of power here. We browsed the Store Management category, for instance, and found add-ons to integrate our store with Xero, QuickBooks, FreshBooks and Lightspeed; intelligently handle EU VAT and remove charges for eligible businesses; serve digital products via Amazon S3; send SMS alerts to customers when their order status is updated; and equip your store with Olark live chat. There aren't as many free extensions as you'll sometimes see elsewhere, and you might find you have to spend money on commercial extensions (reporting, for instance) to get the same level of functionality that other platforms give you as standard. But overall, WooCommerce offers a capable set of integrations which can greatly enhance both your store and business workflow. There is one potential issue in the limited availability of support. If you need general help, all you can do is raise a web-based support ticket, replies might take a day or two, and if you've got a heavily customized system, there's no guarantee anyone will be able to help. Experienced users shouldn't be too concerned - WordPress is a very well-known platform, and there are plenty of troubleshooting resources around - but novices might take a while to solve more complex issues. A smart e-commerce choice for experienced users who'll make use of the power and configurability of the WordPress base, but beginners will probably be more comfortable elsewhere.